Brandon's class was at the Pudding Store. 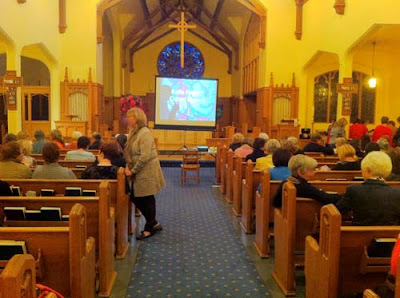 For Kaffe Fassett's lecture the venue was moved to an Anglican church. I know. I was surprised, too. It was very well attended and I heard that there were between 250 and 300 people in the audience. There didn't appear to be an empty seat. Even the balcony was full. About half an hour before the lecture began. The lecture and slide show were very entertaining. Kaffe can be quite funny at times. 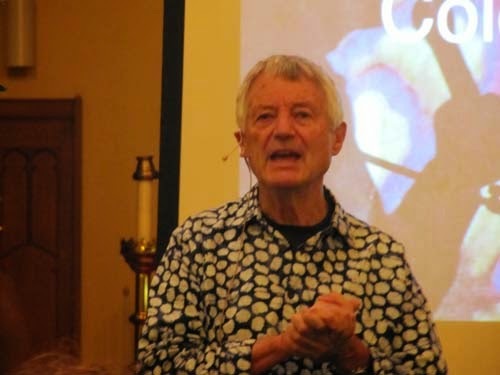 There was one story in particular about a woman who commented on his knitting, told him he was doing it wrong and that he should check out a designer named Kaffe Fassett as he could learn much from him! The slide show was a blend of his knitting, painting, inspirations, fabric designs and quilting. He's working mostly with fabrics and quilting these days. As a matter of fact, he lead a quilting workshop the following day. Brandon had handled the knitting workshop. I would love to see something new in his sweater or garment designs. In the Q&A after the lecture I asked if there would be another knitting-related book in the future. He said that there were no plans to do one at the moment. Too bad, but then again, maybe it's a good thing as there are many of his older creations that I would love to make. One of the last pictures that he showed was a rose that has been named after him. He seemed truly touched and honored. It's a beauty...click here to see it. I love that story about Kaffe doing it rong. I will be telling that one again!